With regular wear and tear, your washing machine’s water houses may bust or leak. In order to maintain these water houses, check them every once in a while to see if they are weak or have been worn. You may notice a small blister in the house’s rubber coating that is sensitive to rupturing. 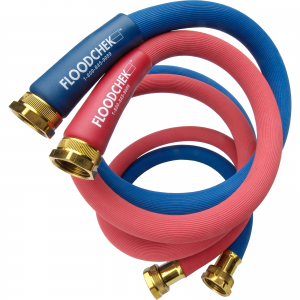 We recommend changing these hoses once every five years. Note: A great deal of water could spill out of the house if it in fact does snap. You may get burned if the hose has hot water within its tube. To calm your nerves, you may be interested in using high quality stainless steel fill hoses. They also have the black rubber houses made directly by the manufacturer. When your heavy washing machine is not level, you may hear a strong vibration while the unit is in its spin cycle. The washing machine can even rock and bang back and forth if all four legs are not solidly planted on the floor. Make sure the unit is completely level so that it does not “walk.” Obviously, a rocking washing machine does not bode well and can also damage surrounding items. Front leveling legs accompanied by a lock not are adjustable on your washing machine. Simply, adjust the leg to your desired height. Then, tighten the lock not up against the machine. This will ensure that leg doesn’t rotate uncontrollably. In some units, adjustable leveling legs are installed in the back as well. These can be adjusted in the exact same way as the front leveling legs. Try to put the machine as close to the floor as you can because the closer it is to the ground, it will have a less chance of vibrating. However, the majority of machines have rear legs that are “self-adjusting.” In order to set these legs, make sure to tilt the machine to the front all the way to its front set of legs; so that the rear legs are three—four inches above the floor is ideal. Then, set the machine back to the floor. The legs should subsequently automatically adjust, but if they do not, you should tilt the machine forward once again. Try hitting the back legs with a hammer handle so that they become loose. If you would like us to repair your washer, call us at (714) 769 6469 to schedule an appointment. With your washer, there is either a porcelain-coated steel or painted steel cabinet. Feel free to use a damp sponge with a spray of dish detergent to wipe the surface clean of all stains. You can also use a dab of non-abrasive cleaner if the stains are tough. In the vast majority of washing machines, lint is collected during the normal washing cycle. It is usually then sent down the drain when the machine drains. You may have to do something different if you own a Maytag machine because the majority of these units collect lint in the agitator’s center tube. Still other units contain a filter at the tube’s top. If so, slide out the filter. Then clean it off. Finally, you can reinsert it.